This is the most Southern German-speaking holiday region in Europe. Here you can find the renowned South Tyrolean Wine Road with enchanting villages in the entire valley basin. The Trudner Horn Nature Park offers the most varied flora and fauna in South Tyrol. The Bletterbach Canyon is the only canyon in South Tyrol and seems like something out of a picture book. The lively capital of Bolzano impresses with a varied culture programme, Renon as a summer resort, and the Sarentino Valley with 140 peaks rounds off the holiday offer. Discover the uniqueness and variety of this region. Bolzano & environs enjoys almost 2000 hours of sun a year and is therefore ideal for an outdoor holiday. 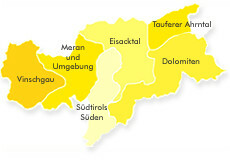 Thanks to the mild climate this is one of the most important wine-growing areas in South Tyrol. This region stimulates your senses throughout the year: scenting orchards and meadows, impressive bathing lakes and alpine peaks offering a splendid panoramic view, wonderful vineyards, and white ski slopes. Bolzano & environs is renowned fort he many outdoor events taking place in summer. Visit the Caldaro Lake Festival, the Castle Rides in Appiano, different wine festivals or enjoy bathing in the cool waters of Caldaro Lake or the Monticolo Lakes. Love sports! There are five different Nordic Walking tours in the beautiful hilly vineyard region of the wine village of Eppan. Tee off in relaxation mode! There are four beautiful golf courses nearby: the 18 hole course 'Petersberg' near Aldein and 'Dolomiti Golf Club' in Sarnonico (TN), 8 km behind the Mendel Pass. In addition, there are the 9 hole courses of 'Gutshof Brandis' in Lana and 'Karersee' at the Karer Pass. The first climbing paths in South Tyrol were mostly created during World War I, in order to supply the soldiers at the Ortler and Dolomite fronts. Today, there are more than 80 climbing paths. An El Dorado for climbing fans are also the climbing gardens of 'Marderwand' between Kurtatsch and Graun, the 'Unterlegstein' in Fennhals, the 'Sefnar Plottn', the 'Tanzbach-Knottn' and the Samer Scharte in the Sarntal valley as well as the climbing gardens in Truden, the climbing halls in Eppan and Tramin and the climbing wall in the Montiggl forest. High-rope gardenThe high-rope garden HETZ in Terlan offers adventure for adults and kids at the highest level: have fun, walk on new paths, conquer frontiers, change look out points… Ideal for leisure and sports clubs, annual office outings, company days and family events. 300 sunny days a year. Lots of time to bathe and get tanned in the bathing lake, the adventure pools and the outdoor swimming pools. These are found in most villages and at all altitudes: from 220 metres in Salurn to 1,221 metres in Oberbozen! The accommodation area of South Tyrol has the highest density of swimming pools in the entire Alpine region! Not only for children: adventure pools Tramin’s sports and adventure pool with a water surface of 1,300 m² is a fascinating experience for everyone. Climbing rocks and a waterfall, a jacuzzi and other water sports such as a floor whirlpool, current pool and underwater massage pool offer you an exciting and cooling variety. The adventure pool at the Large Montiggl Lake with the largest slide in South Tyrol, is a great highlight. The local call it the 'Lido'. It combines the comforts of a swimming pool with the experience of a lake. Sailing & surfingDue to the southern wind which flairs up during the late afternoon, it is possible to run regular sailing tournaments at Lake Kaltern. It is a paradise for surfers. For information about the beach at 'Gretl am See' call Tel: +39 0471 960 055.Rowing contra pedal boatIt is great fun for adults and kids to paddle on the lake, and especially romantic if undertaken at dusk. There is a rental service for rowing boats and pedal boats at the beaches of the large Montiggl lake, as well as Lake Kaltern. Hikingfans Beautiful and varied walking and hiking paths for all levels are offered in this southern district. Relaxed walkers get their money’s worth as much as demanding mountain freaks. In the valleys, there are several possibilities for excursions of the comfortable type. On a higher level, one can find well-marked hiking paths. Mountain tours for the entire family with interesting viewpoints can easily be reached! Winter in the South of SüdtirolThe Sarn Valley, Ritten mountain, Jochgrimm near Aldein, the Salten mountain with Mölten and Jenesien, as well as Altrei and Truden offer the perfect winter magic from the beginning of December to mid April.